For the past 40 years or so, oxidative stress has been increasingly recognized as a contributing factor in aging and in various forms of pathophysiology generally associated with aging. Research in C.elegans has contributed to understand many factors involved in aging, as well as the discovery of new molecules that help to reduce free radicals and oxidative stress damage. Using WMicrotracker, it is possible to easy emulate pharmacologically oxidative stress and measure the effect of new small molecules, genes or natural compounds. Below we present an example of application. 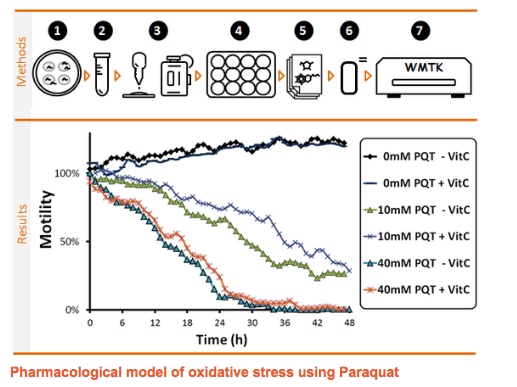 In this experiment we can observe the dynamics of oxidative stress model, and a small protective effect of C Vitamin when worms are exposed to 10mM of Paraquat. Methodology: (1)Grow synchronized populations of worms in NGM plates. (2)Remove worms from plates using buffer. (3)Count #worms in 10ul, and adjust volume to get [5worms/10ul]. (4)Transfer 90ul of worm solution to 96well microplates using multichannel pipette. (5)Incubate with potential antioxidant molecules. (optional:)Let worms to rest for 1h and measure basal activity using WMicrotracker. (5)Add Paraquat. (6)Register worm activity using WMicrotracker.